Born 1977 in Mofolo township Soweto, Lerato loved the art lessons at school and in her spare time she would sketch. 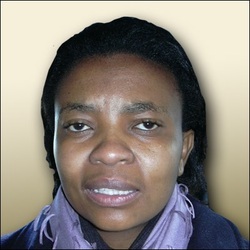 In 1996 she took art lessons and attended Funda, Fuba and Katlehong art centres. She was inspired by Speelman Mahlangu and Martin Tose's works and they encouraged her to upgrade her style and to add a texture to her work. Her naïve art has depth and life in it. Her subject matter are township scenes. She sketches in the townships and then comes home and completes the painting adding texture to her backgrounds. She mixes acrylic paint with a marble dust to build up a texture on her paintings. This texture brings a depth to her work and shows that nothing is flat and straight to her and that whatever you touch or feel has a texture. She loves color and she uses it freely. She respects her people and enjoys portraying them in their everyday situations. She teaches a love of art as well as appreciation of art to her small pupils at a primary school in Soweto. She has participated in group shows in Johannesburg and Cape Town, with Speelman Mahlangu and Martin Tose. Her work has been bought to hang on walls in a number of corporations around South Africa as well as overseas. Her work has a wonderful appeal to local art lovers as well as tourists. People love the bright colors and texture that she has incorporated into her works.